With it's modern contemporary looks this Professional Plus 90 range cooker offers a 5 burner gas hob with cast iron pan supports and a powerful 3.5kW Multi Ring Burner, perfect for Asian style cooking. You can also purchase a specially designed wok cradle from Rangemaster to enable the use of a round bottomed wok if desired. The Professional Plus comes complete with a robust cast aluminium griddle which sits on the hob, providing a sturdy cooking surface ideal for cooking bacon, searing steaks, burgers and fish. If you don't have mains gas an LPG conversion kit can be requested free of charge with your cooker at the time of order. Boasting two generously sized ovens, the Professional Plus 90 can easily cater for a family, enabling the cooking of multiple dishes at the same time. The 90cm version offers the best of both worlds, with one gas oven and one electric. The left-hand oven with its glass porthole door is a gas oven also has the innovative Handyrack which means no more burning your hands reaching in to the oven cavity to check your roast. It attaches to the main oven door and gently pulls the roasting tray out as you open the door and will support a roast weighing up to 5.5 kilos safely. The tall right hand fan oven has four shelves making it perfect for batch baking or family pizza nights in addition to everyday use. The main left-hand oven has catalytic liners which reduces greatly the amount of cleaning required to just the base and door and the tall fan oven has an easy clean enamel coating. The Rangemaster Professional Plus Natural Gas version also features a separate gas grill. Available in a choice of colours there is a Rangemaster Professional Plus 90cm Natural Gas Range Cooker which will look perfectly at home in any kitchen. 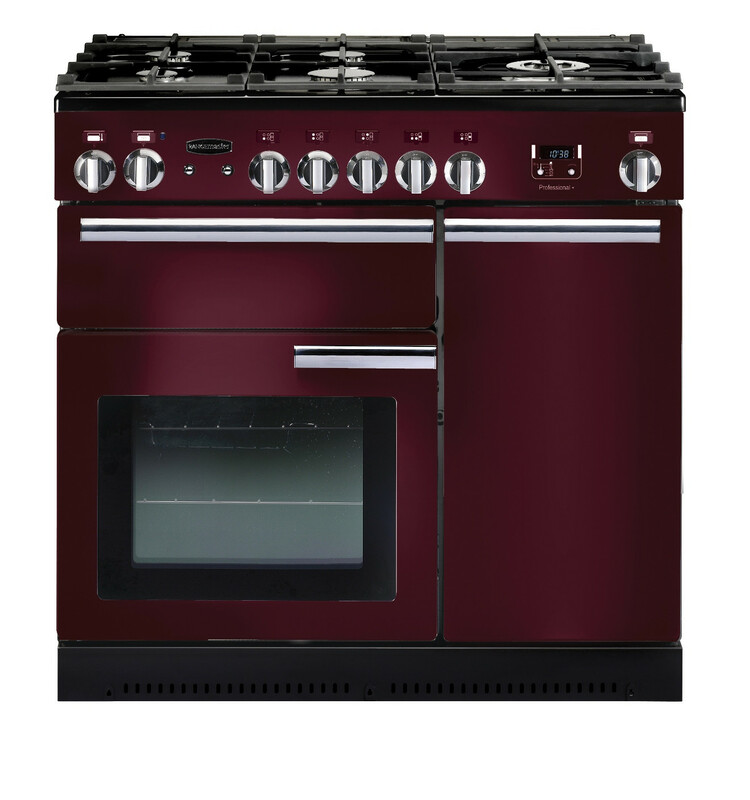 Choose from black, cranberry, cream or stainless steel, all with a stylish chrome trim.